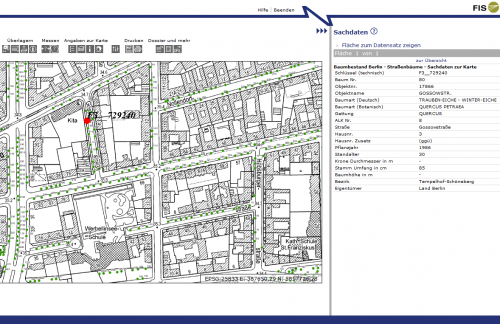 Berlin’s map is for pros, New York City’s is for the masses. 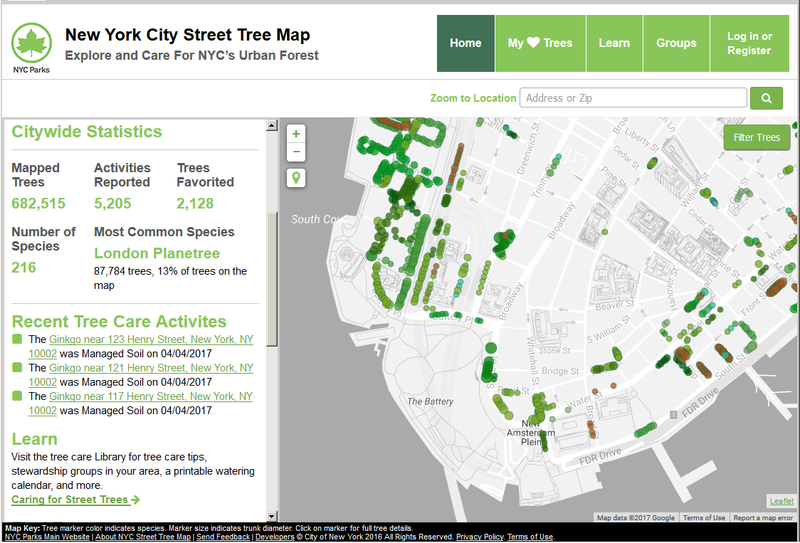 I have noticed the online tree maps from the Berlin and New York City parks departments are very different and decided to compare them. Both cities have mapped their street trees – allegedly all of them – and made interactive maps and data publicly available but they have interesting differences. 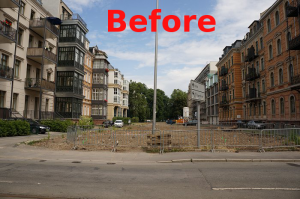 Taking a page from Robert Moses’s playbook: Is Berlin de-greening? 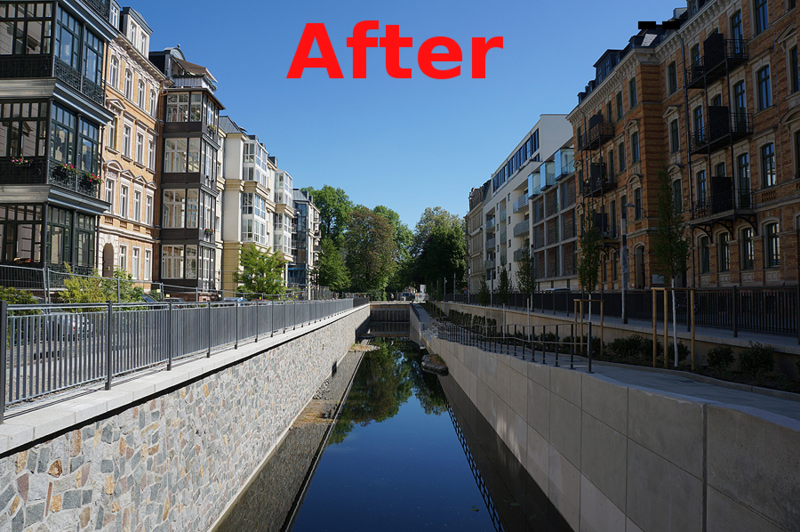 Berlin is bucking global greening trends by building a new highway through its urban core and loosening environmental protections. Officials say there are no other options. Berlin is the last city you’d expect to repeat history’s mistakes. Yet many observers feel the city has recently been doing just that by weakening its environmental protection laws, violating EU environmental regulations, and reopening one of the darkest chapters in 20th-century urban planning history: building a new freeway through the urban core along the lines of those commonly – but far from exclusively – associated with Robert Moses’ notorious 30-year reign as New York City’s omnipotent post-WWII chief planner. There and in countless other places, freeways in the middle of cities were promised to be essential components of “urban renewal”, a term that is now generally agreed upon to refer to the precise opposite of its intended meaning. Both the freeway and rollback of environmental protections reverse the direction taken by livable cities over the last few decades. Planners, historians and city-dwellers are in agreement that virtually every freeway ever built in an urban core has been an unqualified disaster for the overall integrity of urban life, which is why no truly livable city has built one in the last 30, perhaps 50, years. 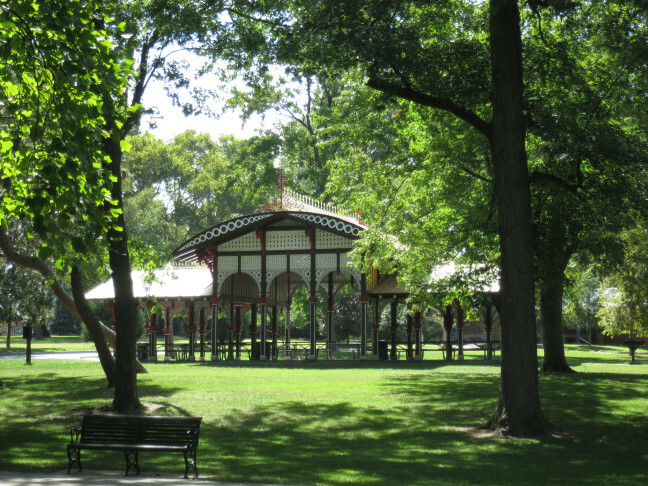 Similarly, it seemed the matter was settled on the many values of urban green space.There’s no need to go into the how and why here, as mountains of research and inquiry have covered the topic. 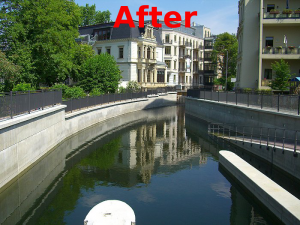 In a controversial move that stunned Berlin’s park users and fans of its abundant green space, the Berlin city council recently announced it is free to ignore at will a construction ban in its largest park which was formally enacted by a citizen referendum that won by a landslide less than two years ago. 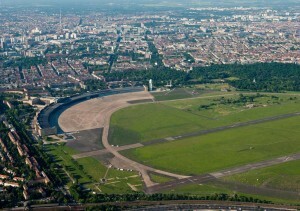 The park, Tempelhofer Feld, is a former airport with an airfield the size of Central Park, one and a half times the size of Berlin’s next-largest park, the centuries-old Tiergarten, and the referendum – which was not merely advisory but understood to have the force of law – dictates that it remain in its current state, an undeveloped airfield crossed by two mile-long runways, with a ban on landscaping and permanent structures except for a handful of restrooms and kiosks around the perimeter. 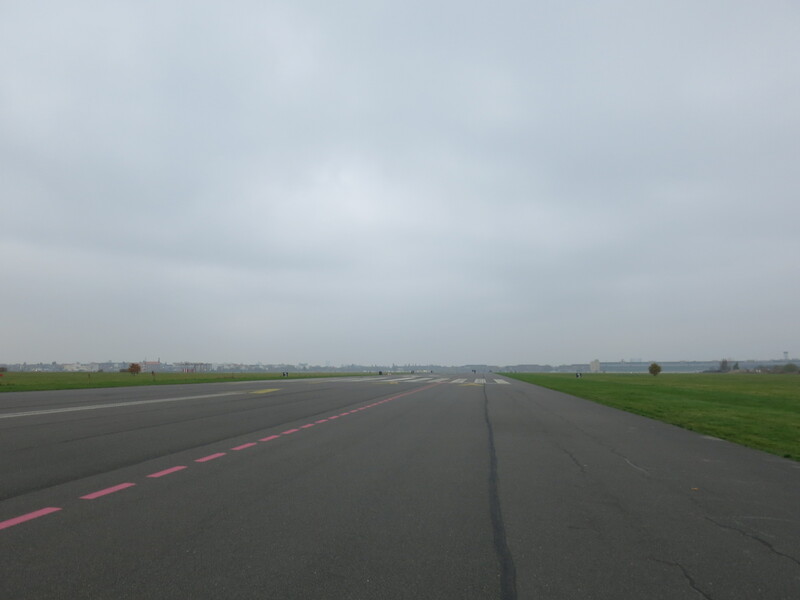 The airport closed in 2008 and lay in a state of limbo for 6 years, its airfield open to visitors as a provisional park devoid of any facilities and its terminal – built in the 1903s by Hitler and for decades the world’s largest building – largely empty although occasionally rented for trade fairs and corporate events. 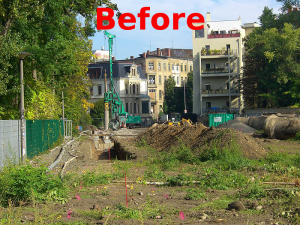 Citizens undertook the city’s arduous referendum process (petition, then an entire second petition, then vote) to save the field and runway as a park, enact an inviolable 10-year construction ban and rescue the site from its likely fate – backed by the mayor, the city government and deep-pocketed developers – as a residential /office/ retail complex with golf courses, with non-binding promises of unspecified amounts of “affordable” housing. Some renderings showed a heavily landscaped, resort-style park in the middle. The ensuing voter referendum won 64 – 36 %(I covered the story here). Then in December 2015, the city decided it needed some area within the park boundaries for refugee camps (yes, they call them camps; more on that below) and stated its legal right to ignore the referendum which virtually all parties agree has the force of law. Citizens were outraged. 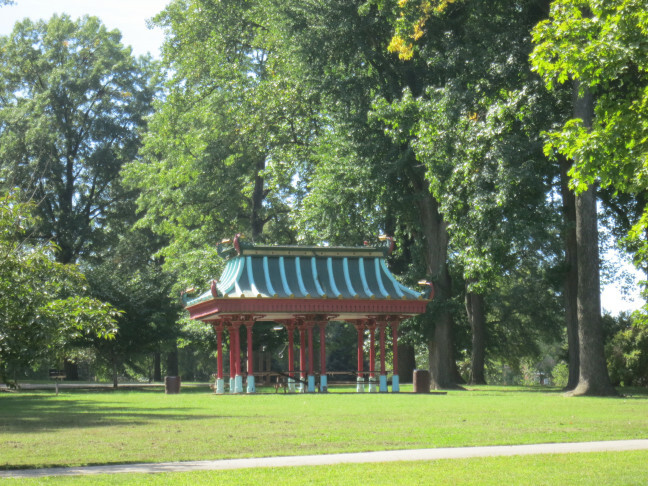 Locals fought back against gentrification and saved a beloved yet stark, almost ascetic park. Outrage over the country’s flood of colossal public works boondoggles probably helped. 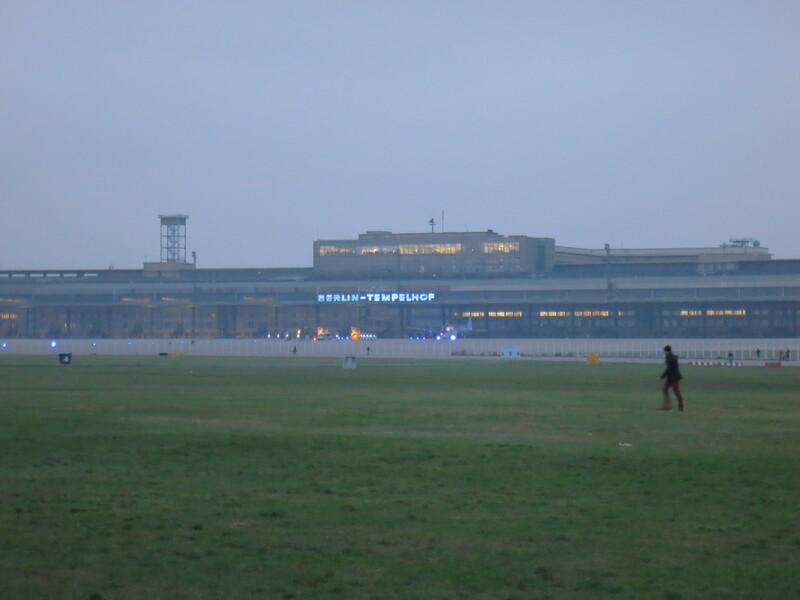 In 2014 Berliners fought for, and won, the preservation of the airfield of Tempelhof, the decommissioned main airport near the city center, as an extraordinary and striking park instead of turning it over to developers for housing-retail-office complexes. 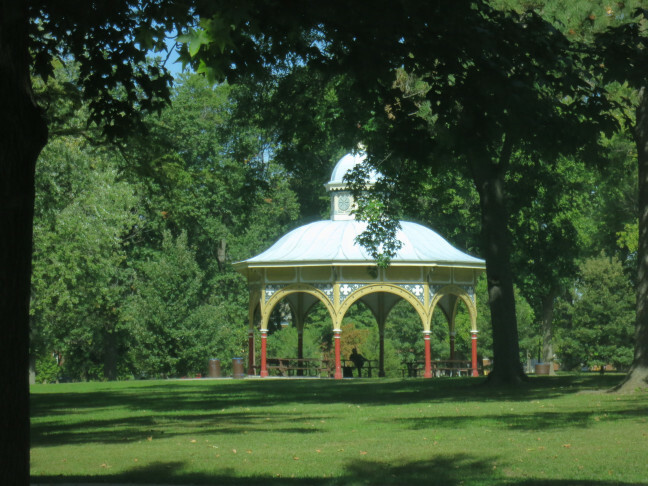 I was in the fall and loved the sweeping uninterrupted emptiness which in good weather fills with people doing everything people do in parks. It’s more an un-park than a park as we know it. They didn’t just vote to keep it as green space, they voted in a law to preserve the airfield untouched and completely ban alterations and permanent structures of any kind. 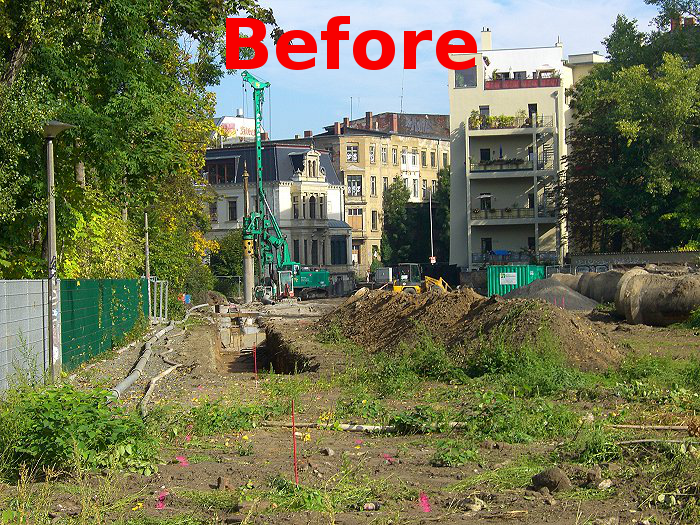 There will be no landscaping, no trees, no sports fields or playgrounds. Just one flat featureless grass expanse the size of Central Park, crossed, of course, by runways. In my hour or two there I saw no benches or rest rooms. (I later learned there are four of the latter, on the the outer perimeter. 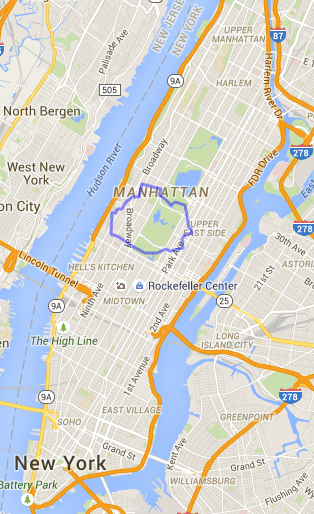 Central Park has 16 scattered throughout.) 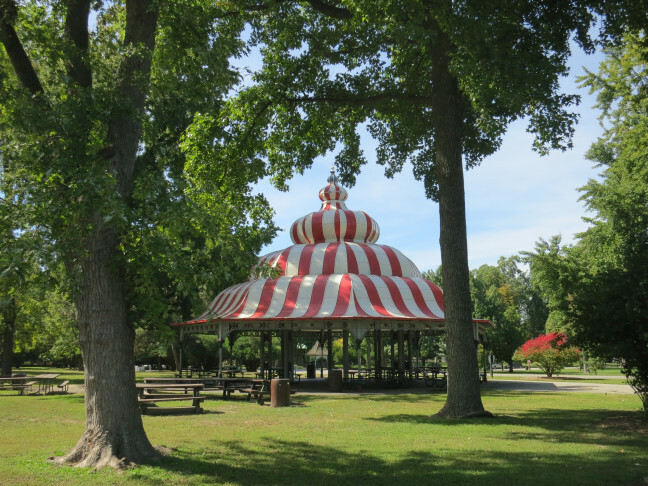 But that hasn’t stopped the park from becoming enormously popular. 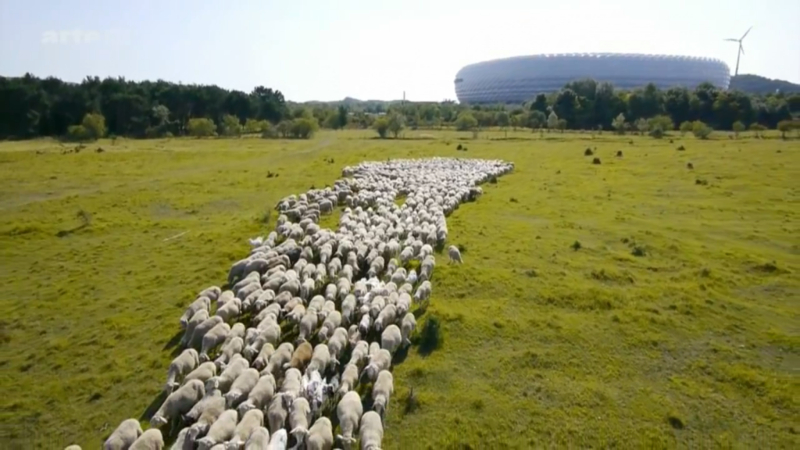 Recently I saw in a documentary these sheep next to the high-tech Herzog & de Meuron starchitect stadium in Munich (about twice the size of New York’s Citi Field) and had to find out what was going on. It turns out the area is a nature preserve consisting of rare chalk heathland remnants and it is indeed adjacent to the stadium. Nothing in English has been written about the site, to my knowledge. The stadium by the way is as futuristic as it looks and I will write about it soon. This type of heathland was once more common in Europe, although never greatly widespread. I’m not sure whether it’s a good thing or bad thing that the stadium is right alongside. On the one hand it’s great to protect nature so close to busy places. On the other, since they were building on a site where there wasn’t a stadium previously, you’d think they could have found someplace less environmentally important and fragile. 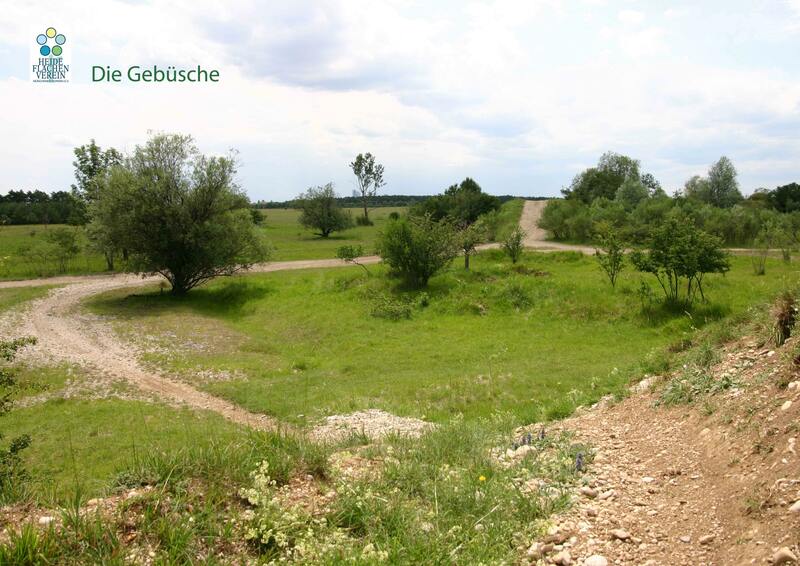 The site, the Fröttmaninger Heath, is one of a handful of similar small patches in a mosaic of villages, outer suburbs, small farms and former artillery ranges traversed by highways on the city’s northern fringe. 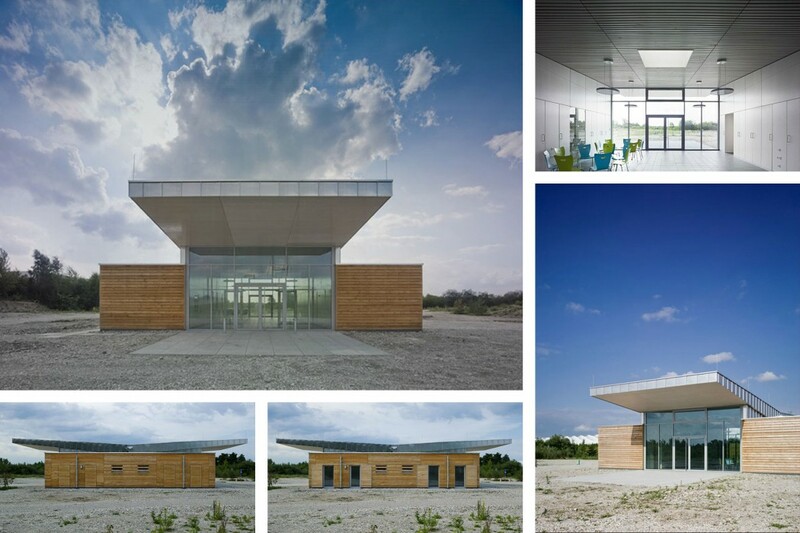 The North Munich Heathlands Association, a partnership of local towns, vigorously protects them by means of an exhaustive ecological planning, research, and restoration program along with recreation management and a supermodern visitors center. 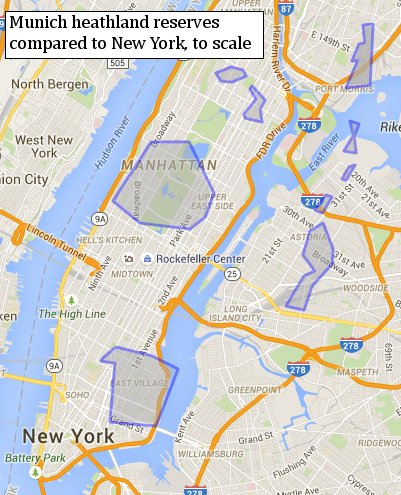 And yet the combined size of the eight sites covers less area than JKF airport. I don’t recall ever seeing a comparable depth of documentation online for a US nature reserve except the very largest, such as Yosemite. It is publicly funded and not a private non-profit organization relying on donations. Nature in Europe is interesting because their conservation works the opposite of ours. While we promote biodiversity by keeping people out of wild places and letting nature run its course, they do the opposite: promoting biodiversity by letting people in. When I first learned this it took me a while to wrap my head around the concept because we are so used to the idea of wilderness and wild places. 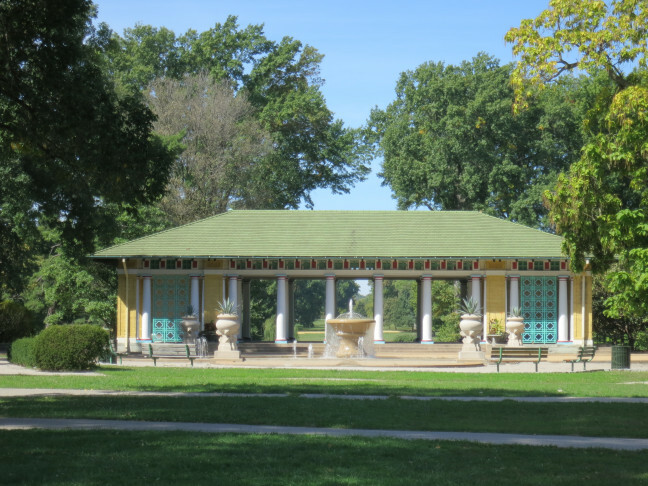 St. Louis’ Tower Grove Park is said to have the largest intact collection of Victorian-era park pavilions – a dozen or so – outside of London’s Kew Gardens. Also, there is abundant evidence of St. Louis’ once-large German population, long since dispersed and assimilated nearly without a trace. 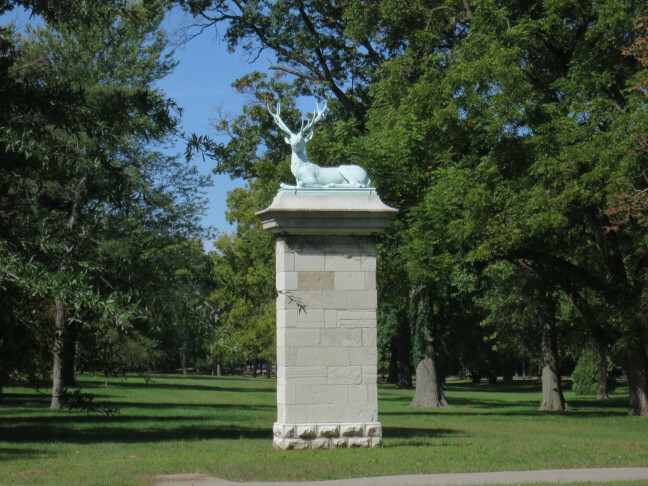 The zinc stag came from Berlin; there are statues of Alexander von Humboldt and Friedrich Wilhelm von Steuben (sometimes called “father of the American military” for his essential service in the American Revolution and who was trailed by rumors and public accusations of homosexuality), and others by a German sculptor.